Despite controversies in theory and in practice when measuring wellbeing and quality of life, there is sufficient agreement to consider these constructs to be relevant in the context of elderly people to identify factors that affect living conditions and quality of life at older-adult ages. 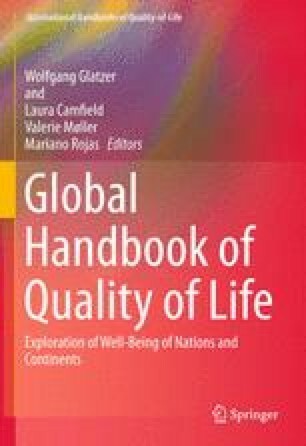 This chapter is drawn from a wider perspective on theory and empirical research in quality of life and wellbeing. Based on the analyses of the backgrounds on quality of life throughout the literature to review the concept, domains and measurements instruments, we look into several ageing longitudinal works in order to analyze the factors that most contribute to quality of later life within a worldwide context and from a longitudinal approach. We finish with a reflection on public policy and quality of life related to old people. Banks, J., Lessof, C., Nazroo, J., Rogers, N., Stafford, M., & Steptoe, A. (2010). Financial circumstances, health and well-being of the older population in England. The 2008 English longitudinal study of ageing (wave 4) (409 p). London: The Institute for Fiscal Studies. http://www.ifs.org.uk/elsa/report10/elsa_w4-1.pdf. Accessed 18 June 2013. Banks, J., Nazroo, J., & Steptoe, A. (2012). The dynamics of ageing. Evidence from the English Longitudinal Study of Ageing 2012–2012 (wave 5) (321 p). London: The Institute for Fiscal Studies. http://www.ifs.org.uk/elsa/report12/elsaW5-1.pdf. Accessed 12 June 2013. Barrett, A., Savva, G., Timonen, V., & Kenny, R. A. (2011). Fifty Plus in Ireland 2011. First results from the Irish Longitudinal Study on Ageing (TILDA) (304 p). Dublin: The Irish Longitudinal Study on Ageing. http://www.rte.ie/news/2011/0509/ageingstudy.pdf. Accessed 12 June 2013. Bowling, A. (2009). The psychometric properties of the older people’s quality of life questionnaire, compared with the CASP-19 and the WHOQOL-OLD. Current Gerontology and Geriatrics Research, 2009, 12 p, Article ID 298950. doi: 10.1155/2009/298950. Breeze, E., & Stafford, M. (2010). Receipt and living of help and care. In J. Banks, C. Lessof, J. Nazroo, N. Rogers, M. Stafford, & A. Steptoe (Eds. ), Financial circumstances, health and well-being of the older population in England. The 2008 English Longitudinal Study on Ageing (wave 4) (pp. 348–385, 409 p). London: Institute of Fiscal Studies. http://www.ifs.org.uk/elsa/report10/ch9.pdf. Accessed July 12 2013. Brown, J., Bowling, A., & Flynn, T. (2004). Models of Quality of Life: A Taxonomy, Overview and Systematic Review of the Literature. European Forum on Population Ageing Research. https://groups.google.com/forum/#!topic/abohabibas/Hoi0W-STeYI. Accessed 22 July 2013. Cardona, L. A. (2010). Understanding quality of life in older adults. MS thesis, University of North Texas, 141 p. http://digital.library.unt.edu/ark:/67531/metadc28402/m2/1/high_res_d/thesis.pdf. Accessed 5 Mar 2012. CEDEFOP. (2012). Working and ageing. The benefits of investing in an ageing workforce (315 p). Luxembourg: EU Publications Office. http://www.cedefop.europa.eu/EN/Files/3064_en.pdf. Accessed 9 July 2013. Demakakos, P., McMunn, A., & Steptoe, A. (2010). Well-being in older age: A multidimensional perspective. In J. Banks, C. Lessof, J. Nazroo, N. Rogers, M. Stafford, & A. Steptoe (Eds. ), Financial circumstances, health and well-being of the older population in England. The 2008 English Longitudinal Study on Ageing (wave 4) (pp. 115–140, 409 p). London: Institute of Fiscal Studies. http://www.ifs.org.uk/elsa/report10/elsa_w4-1.pdf. Accessed 18 June 2013. Gasper, D. (2004). Human well-being: Concepts and conceptualizations (WIDER Discussion Papers/World Institute for Development Economics (UNU-WIDER), No. 2004/06) (34 p). http://www.wider.unu.edu/publications/working-papers/discussion-papers/2004/en_GB/dp2004-006/. Accessed 14 June 2013. Jenkins, A., & Mostafa, T. (2013). Learning and wellbeing trajectories among older adults in England (DoQSS Working Paper No. 13–02) (49 p). http://repec.ioe.ac.uk/REPEc/pdf/qsswp1302.pdf. Accessed 7 Mar 2013. Netuveli, G., Blane, D., & Bartley, M. (2007). Wellbeing and welfare states: Cross-national comparison of quality of life in market and transition economies. Wellbeing in international development conference, University of Bath, 22 p. http://www.welldev.org.uk/conference2007/final-papers/5-irg/Netuveli_Blane_Bartley.pdf. Accessed 10 Nov 2011. Newton, J. (2007). Wellbeing research: Synthesis report. DEFRA Commissioned Research. http://archive.defra.gov.uk/sustainable/government/documents/Wellbeingresearchsynthesisreport.pdf. Accessed 20 June 2013. Population Reference Bureau. (2012). World population data sheet. http://www.prb.org. Accessed 17 Mar 2013. Rand Survey Metadata Repository. (2011). Study descriptions. Health and retirement studies around the world. https://mmicdata.rand.org/meta/study_descriptions.pdf. Accessed 6 Mar 2013. Schuller, T., Wadsworth, M., Bynner, J., & Goldsteing, H. (2012). The measurement of well-being: The contribution of longitudinal studies. London: Office for National Statistics. http://www.ons.gov.uk/ons/guide-method/user-guidance/well-being/publications/the-contribution-of-longitudinal-studies.pdf. Accessed 7 June 2013. Stiglitz, J., Sen, A., & Fitoussi, J.-P. (2009). Report of the commission on the measurement of economic performance and social progress. http://www.stiglitz-sen-fitoussi.fr/documents/rapport_anglais.pdf. Accessed 17 Apr 2013. UNFPA, & HelpAge International. (2012). Envejecimiento en el Siglo XXI: Una Celebración y un Desafío. Resumen ejecutivo (8 p). Nueva York/Londres: Fondo de Población de Naciones Unidas (UNFPA)/HelpAge International. http://www.helpage.org/resources/ageing-in-the-21st-century-a-celebration-and-a-challenge/. Accessed 13 Apr 2013. United Nations. (2012). Population ageing and development 2012. New York: United Nations. http://www.un.org/en/development/desa/population/publications/ageing/population-ageing-development-2012.shtml. Accessed 14 Apr 2013. World Health Organization. (2002). Active ageing. A policy framework. Geneva: World Health Organization, Department of Health Promotion, Noncommunicable Disease Prevention and Surveillance. http://whqlibdoc.who.int/hq/2002/who_nmh_nph_02.8.pdf. Accessed 15 July 2013. World Health Organization. (2011). World report on disability 2011. Geneva: WHO. http://www.who.int/disabilities/world_report/2011/en/index.html. Accessed 10 Nov 2012.